he won the silver medal at the First International Van Cliburn Competition in the USA. In 1964, he won the silver medal at the Queen Elizabeth Competition in Brussels. Since then, he has played frequently to foreign audiences. Nikolai Petrov is considered one of the most phenomenal pianists of his generation. He performs between seventy and one hundred concerts a year, of which ten to fifteen take place in the Great Hall of the Moscow Conservatory. 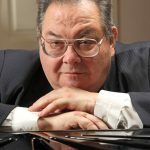 For the past twelve years (from 1995), he has had his own series of performances at the Moscow Conservatory entitled “Nikolai Petrov Plays.” His concerts in Moscow and abroad are consistent sell-outs, and his work is rated very highly by music critics. Nikolai Petrov has recorded with Russia’s leading directors, such as Evgeny Svetlanov, Kirill Kondrashin, Yuri Temirkanov, Gennady Rozhdestvensky, Arvid and Maris Janson, Pavel Kogan, and many others. He has performed with the New York Symphony Orchestra, the Washington National Symphony Orchestra, the Los Angeles Symphony Orchestra, and top European orchestras such as the Berliner Philharmoniker, the London Symphony Orchestra, the Royal Philharmonic Orchestra, the AHK Orchestra, etc. He has received standing ovations in Carnegie Hall and Lincoln Center in New York, the Kennedy Center in Washington D.C., the Chopin-Pleyel Hall in Paris, the Concertgebouw in Amsterdam, the Barbican Centre, the Royal Festival Hall and the Royal Albert Hall in London, the Theater Colon, and many others. Nikolai Petrov’s repertoire includes around fifty solo programs and fifty-five concerts with orchestra. Many of his soloist and symphonic performances were premiere performances both in Moscow and in other cities throughout the world. In 1986, the Académie Balzac awarded Nikolai Petrov its Grande Medaille d’Or for excellent performances worldwide of the works of Balzac’s contemporaries such as Berlioz, Beethoven and F. Liszt. Over the past three seasons (as of 2007), Nikolai Petrov has performed three Bach concerts, all of Beethoven’s piano concertos, including the Choral Fantasy, all of Rachmaninov’s piano concertos, including the first ever performance of the First Edition of Concerto No. 4. The “French Music for Piano and Organ” program prepared by Nikolai Petrov together with organist Ludmila Golub was elected best musical program for 1996 by the Musical Review magazine. In the same year, he was also elected Musician of the Year. He has released around twenty compact disc recordings under the Olympia label (UK), Russia’s Melodia label, and others. Nikolai Petrov holds a professorship at the Moscow Conservatory, and is President of the Russian Academy of Arts, President of the Russian Society for Associated Rights, Chairman of the Music Section of the Presidential Council on Culture and the Arts, and a member of the Russian State Prize Committee. Nikolai Petrov is a People’s Artist of the USSR and Laureate of the Russian State Prize. On October 1, 1998, he established the Nikolai Petrov International Philanthropic Foundation.